The SF Green Party will host a candidate forum this Tuesday, 9/6, from 6-9 pm--come ask questions to candidates in local races. Our forum and endorsement meeting will take place in the Mojo Theater, on the 2nd floor of the Redstone Building, located at 2940 16th Street (between Mission and South Van Ness, 1 block from 16th St BART). The event is open to the public and all are invited! Note that we do not currently have questionnaires for the other contests; all candidates who our active members expressed potential interest in endorsing were invited. 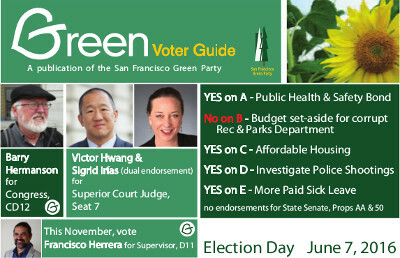 These are the SF Green Party Endorsements for the June 2016 election. We will be mailing a postcard like the one below to all our members, so if you can help, please click the "Donate" link to the left. 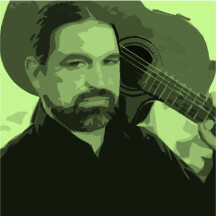 A complete Green Voter Guide is now posted. Click "read more" to see full explanations of the reasons behind our endorsements. If you re-registered in order to vote in another party's primary, please re-join the Greens after June 7 to help us stay on the ballot! This is our report card for the SF Board of Supervisors in 2015. It shows the most important votes in 2015, from a Green Party perspective, and whether each supervisor supported or opposed our position. Some of the votes are on amendments to legislation. Compare to our 2014, 2013, and 2012 report cards. 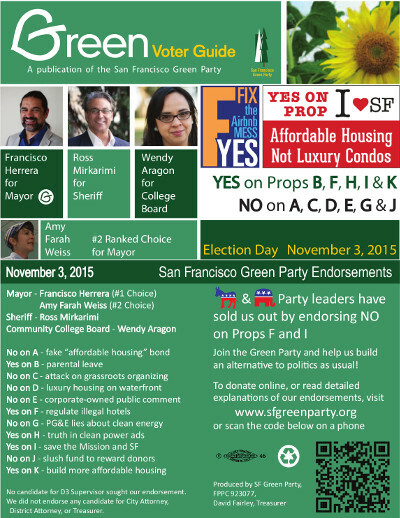 These are the SF Green Party Endorsements for the November 2015 election. We will be mailing a postcard like the one below to all our members, so if you can donate to this effort please click the "Donate" link to the left.